Commonly called the glory lily, flame lily or climbing lily, this plant should be recognised by all ex-pat Zimbabweans and some Indians. Oddly enough, it originates in both areas and is the national flower of Zimbabwe and also accorded special status in the state of Tamil Nadu in India. It is only a very distant relative of the lily, being a member of the colchicum family and because it is full of the chemical colchicine, all parts of the plant are poisonous. Colchicine is used to double the chromosomes in plant cells and is highly toxic in concentrated form. Not that I have ever seen anybody want to eat gloriosas. The plants grow from V shaped tubers which will survive in very dry, sandy conditions so we use them in the narrow dry house border facing north where very little else but succulents will grow. They are winter dormant and never get watered, even in summer. The tubers find their own required depths and can end up quite some distance below ground. 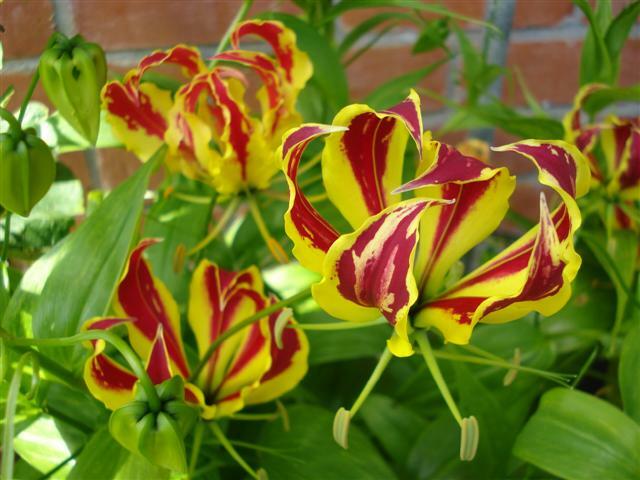 Gloriosa is a good cut flower, lasting well in a vase though the pollen can stain. But look at the flower shape. It opens conventionally enough but then the petals reflex entirely (in other words they all bend backwards) leaving the anthers and stamens completely exposed. Sometimes the petals can be so recurved that it looks like a full crown with fringe. The colours are always in the yellow/orange/red spectrum and the most desirable forms tend to be those with the sharpest yellow and dark red contrast. It is not particularly rare in this country, so you should be able to find gloriosas if you want them and they are an ideal plant for sandy, coastal gardens. This entry was posted in Plant collector and tagged Abbie Jury, climbing lily, flame lily, gloriosa superba, glory lily, The plant collector on 15 January 2010 by Abbie Jury.